She was to be our guide on our 4 hour Sound of Music tour. She picked us up from the door of our hotel. We chose to do the van tour, as it was more personal than the bus tour, and to our great delight, we were the only ones on this particular tour, so we had Rosa-Maria all to ourselves. 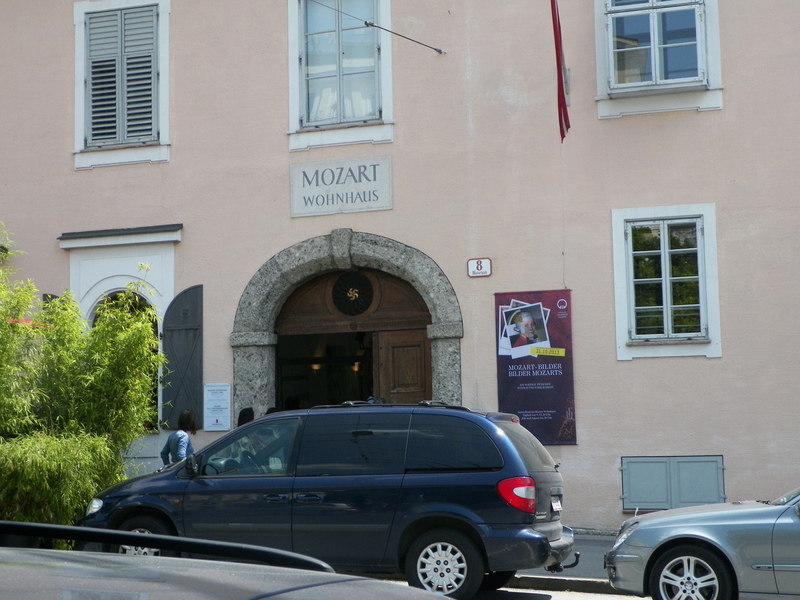 After acquainting us with some other non-Sound of Music related sites (Mozart’s Residence, etc. 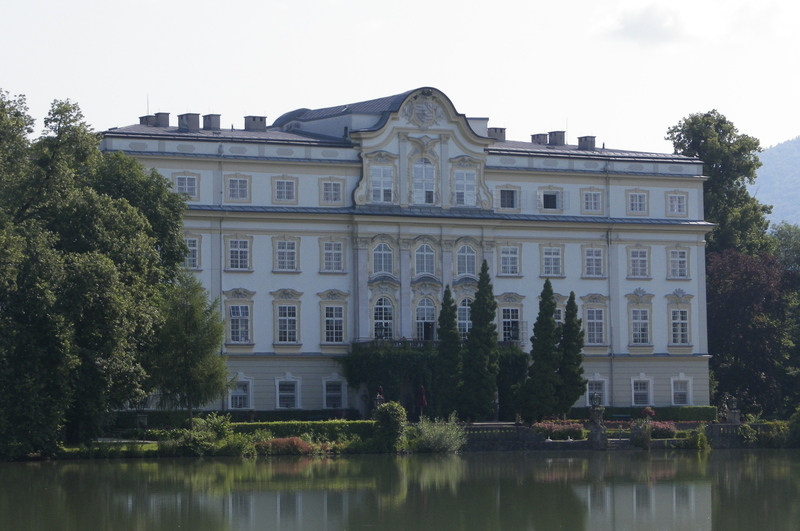 ), she took us to the house used as the back of the Von Trapp home (Schloss Leopoldskron.) This house is actually a private college. The popularity of the movie led to enough “crazed fans” coming that the college requested the gazebo be moved. (Our guide told us one woman broke her ankle dancing around in the gazebo!) 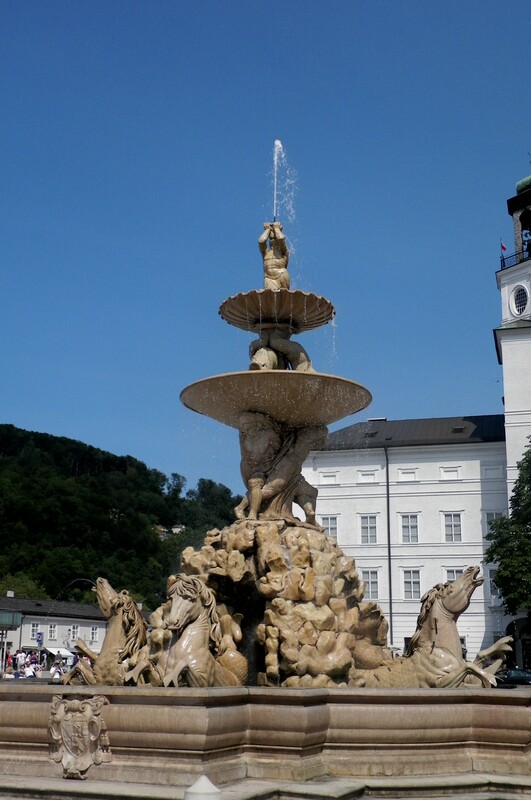 Schloss Hellbrunn is its new home (and home of the trick fountains–we’ll explore there more tomrorrow…). 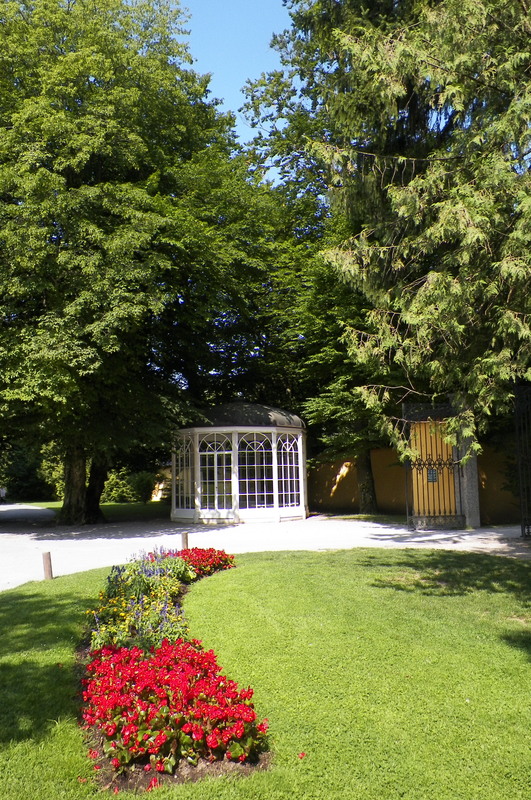 Scholss Hellbrunn also houses a tree lane which looks like the one in the movie–the one in the movie is now a lakeside road with very small trees. We also drove by the house used for the front, but it is a private residence, so I just got a drive-by picture. We’re going to try to get closer tomorrow, so stay tuned. Next, we headed to the Lake District, which contains some of the most beautiful scenery imaginable. 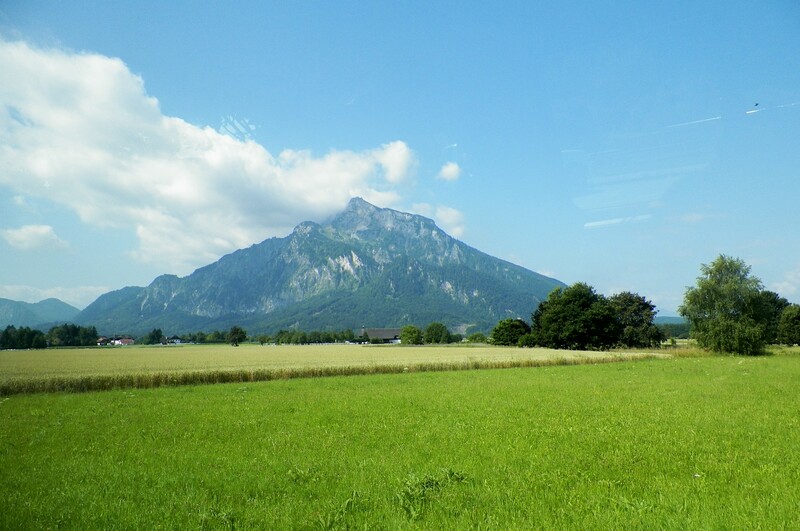 The mountain that the Von Trapps escaped over into Switzerland contains two errors: First, the one used in the film is Mount Obersalzburg, which actually leads to Germany, not Switzerland. Additionally, the Von Trapps did not escape by mountains at all; they took a train to Italy, then a boat to the United States. The Lake District was breathtaking, and the view from the terrace of Muehlradl Cafe-Restaurant provides and excellent view of the landscape used in the opening sequence of the movie (and also provides good desserts). 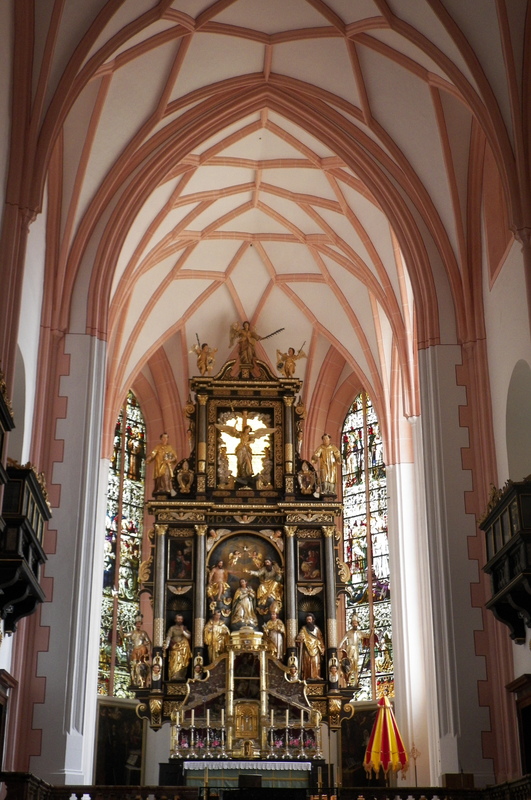 From there, we headed back over the winding roads to the Mondsee Cathedral, which was used for the captain and Maria’s wedding. In the movie, the church is entirely white. This was because some brilliant person many years ago decided it was easier to paint over all of the beautiful frescos with white paint rather than to restore them. $4 million Euros and three years of work later, it’s been returned to its original glory. Finally, we concluded our amazing trip with Mirabell Gardens which contains the majority of the set of the Do-Re-Mi song, including the fountain the children splash in, the Gnome garden, and the steps on which Maria sings. We said good-bye to Rosa-Maria. She had been an excellent tour guide. In addition to sharing the sites of the Sound of Music, she made it her job (and joy) to share facts you couldn’t learn in a guide book. 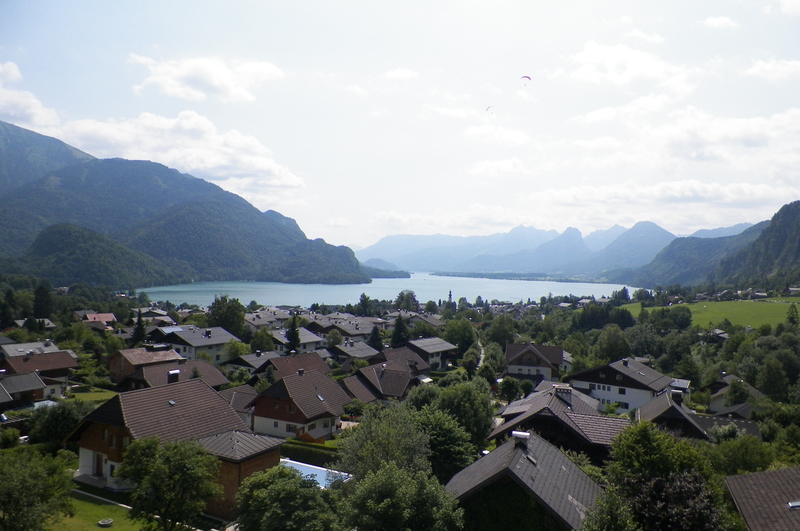 Having had the opportunity to interview three members of the Von Trapp family personally, as well as many townspeople who were present when the movie was filmed, she had been a wealth of all kinds of information. 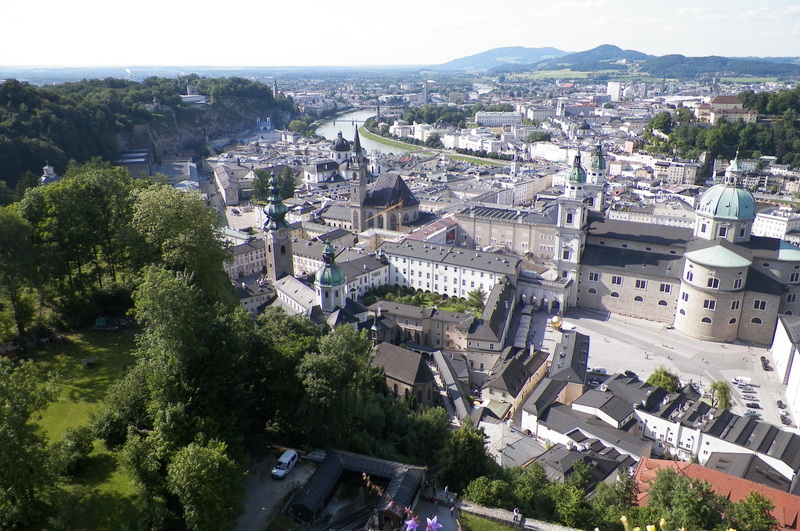 She had also pointed us to fun places to spend money–from food, to souvenirs, to opportunities to luge (we declined)–given us insight into customs and key sites, and even shown us fun sites like the headquarters of Red Bull. It is an amazing experience to walk down the gates and look how how each person chose to be remembered. 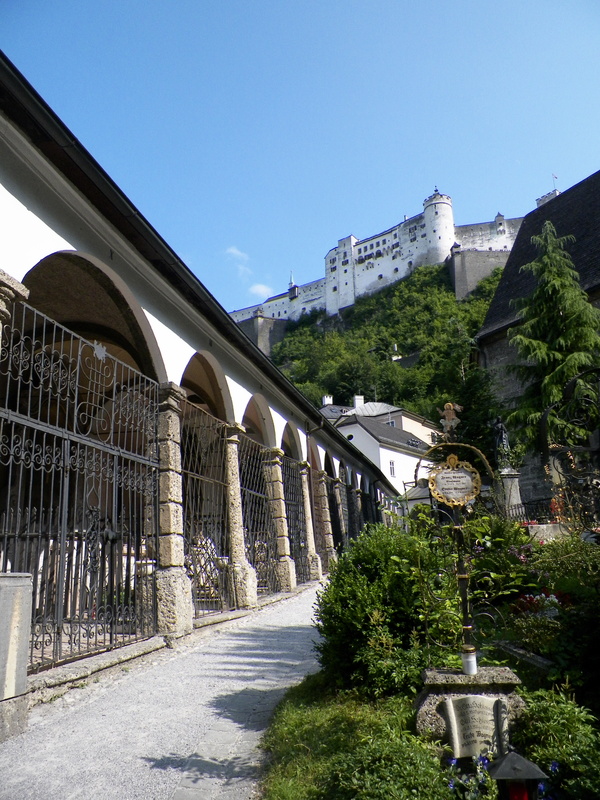 Upon leaving the cemetery, it was a short walk to the funicular for the fortress Hohensalzburg. If. like me, you have no idea what a funicular is (and assume someone is mispronouncing vernacular), it is a cable rail that goes up a cliff while another comes down to balance the weight. It’s actually a cool and terrifying experience, if like me, you’re afraid of heights. This one was built in 1910 to replace the ones that utilized animals to pull carts up the mountain–I can’t imagine. 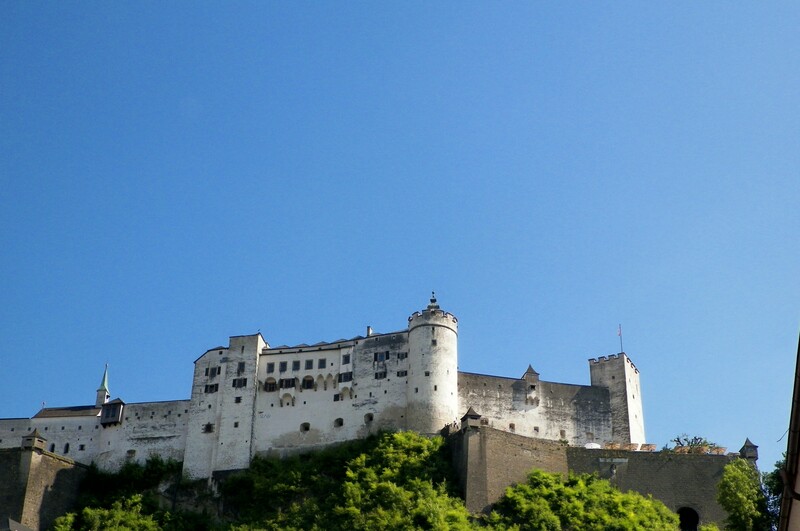 We came down from the fortress in time to catch the last boat tour which gives an entirely different perspective of the city as viewed from the Saltz River. Completely exhausted (especially after an extremely late and challenging dinner), we got home about 11:00. But tomorrow is a new day and more adventures will follow!